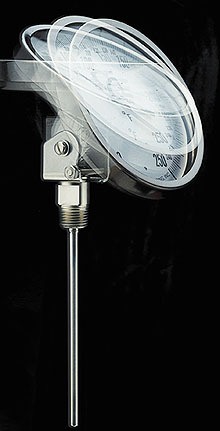 The Model J DialTemp™ bi-metal thermometer features a swivel neck which allows the large 5" dial to be set at any angle within its full 90° tilt range. In addition, the head can also be turned through a full 360° range. The extent of the tilt and rotational adjustment are shown in the diagram below. This features solves many problems, and improves dial readability for many installations. With the Model J, readability is simple – just set the head angle to the position where the user can see it best. These rugged thermometers are manufactured from stainless steel welded construction. The 1/4" diameter probe is supplied with a 1/2" NPT fitting, making Model J thermometers compatible with standard thermowell designs. For available stem lengths, ranges, and configurations please review the Product Spec Sheet . For custom stem lengths, consult the Sales Department. * Minimum Stem Length - 4"
Click Here to Order BY Part Number. Model X - Other configurations may be available please consult sales. Model L - Other configurations may be available please consult sales. Nota: Other temperature ranges may be available please consult sales.